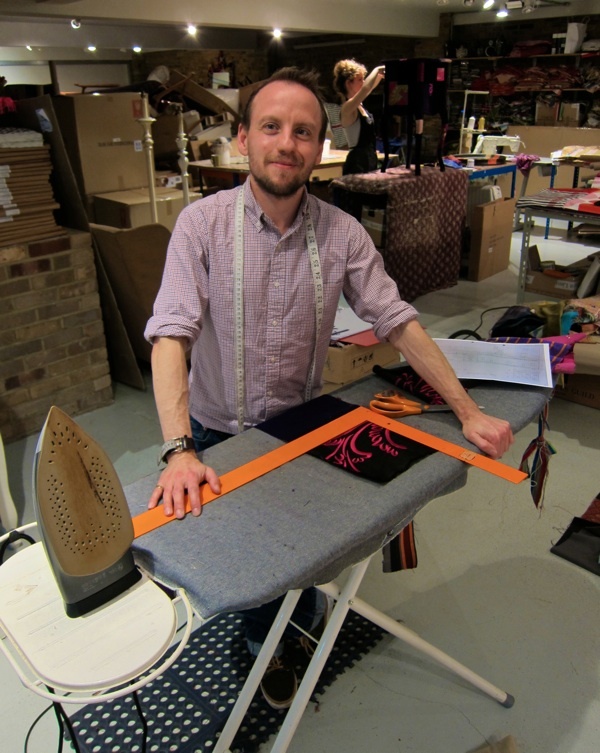 Seamster, Lucas McKenna, works in a basement in Shoreditch High St at the heart of the district that once housed London’s furniture and upholstery trade – now given a new injection of life by Lisa Whatmough who started Squint Limited seven years ago in Redchurch St, creating distinctive furniture in a contemporary style that maintains a skilled craft tradition. 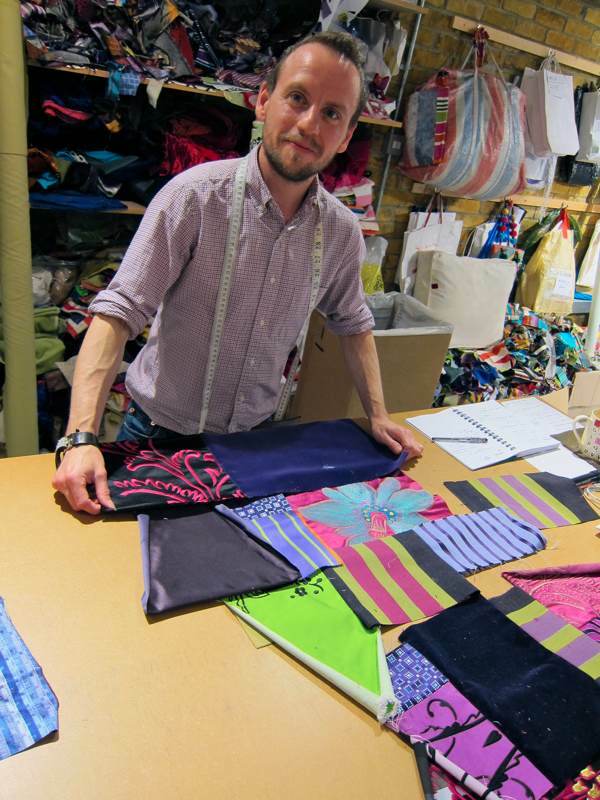 Lucas spends his days sewing all the different scraps of cloth together which go to make up the fabric of these pieces, conscientiously arranging colours and textures to achieve the subtle balance of harmony and contrast that gives them their appeal. Born in Stratford and living in Whitechapel, Lucas pursues a long-standing East End trade in a modern way. “I studied graphic design but I have always enjoyed making things and I didn’t want to work solely in front of a computer.” he admitted to me,“My mum always made odds and ends, and wedding dresses, and I have been sewing from about fifteen or sixteen years of age.” At first, Lucas worked at a prop-making company in the Borough where he became head of the sewing department, then in Whitechapel for a vintage clothing company doing alterations and repairs, before he came to work for Lisa five years ago. It is impossible to walk past the small frontage onto the street and not have your eyes drawn by the dazzling array of upholstery on display, yet few have seen the huge basement concealed beneath which is the centre of operations. 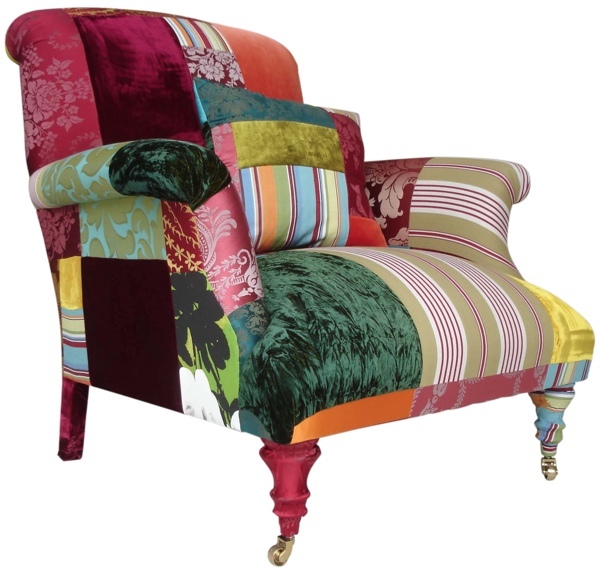 The walls are lined with the rolls of silks, satins, velvets and deck chair stripes in lavish colours – the constituents of this particular art. To one side are two desks where orders are taken and Lisa’s dog Stanley sleeps upon an elegant sofa in a persuasive demonstration of the comfort of the upholstery. To the other side, furniture, lamps and mirrors are being wrapped in the signature patchwork style while – at the centre – Lucas works, moving between his ironing board, his sewing machine and his work table where he decides upon the best juxtapositions of textiles to achieve the optimum effect. 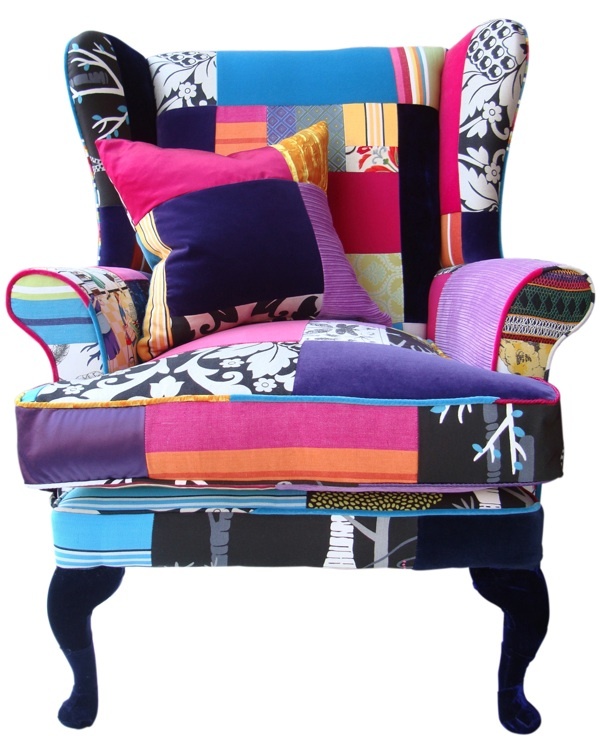 When I arrived he was working upon a piece of patchwork cloth to upholster a Chesterfield. All the work here is bespoke and no two pieces of furniture are ever the same. Lucas refers to a page with swatches of fabric selected by the customer and is guided by an upholsterer’s pattern which tells him the size and shape of the cloth that he needs to make. The work-in-progress was laid out upon the floor and, as we sat chatting, my appreciation grew as I recognised the deliberate composition of colour, pattern, texture and scale which Lucas had created. 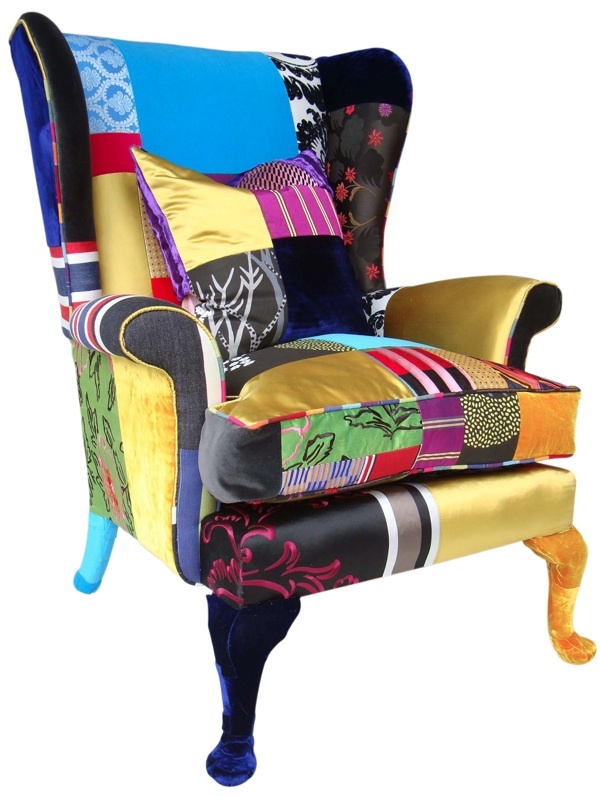 It was, in effect, a three-dimensional collage using larger blocks of colour to offset smaller patches of detailed pattern and in which lustrous silks shone beside velvets in rich hues that absorbed the light. 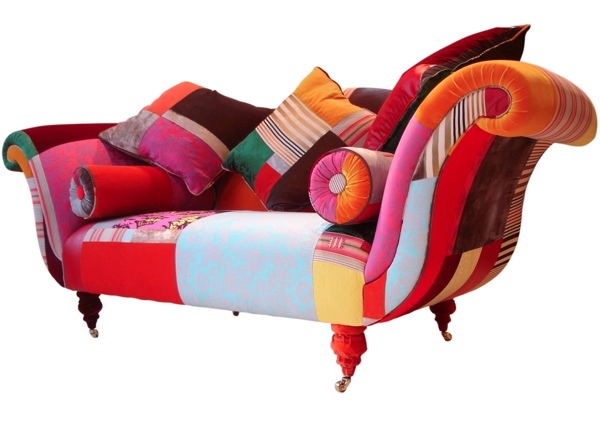 Lucas worked by arranging pieces of fabric upon a flat surface but in his mind’s eye he was creating a sculptural form, with all the colours and patterns sitting in the ideal places upon the finished upholstery. And it is all more work for the seamster, delighting in the endless jigsaw puzzle and infinite permutations of combining fabric in upholstery. 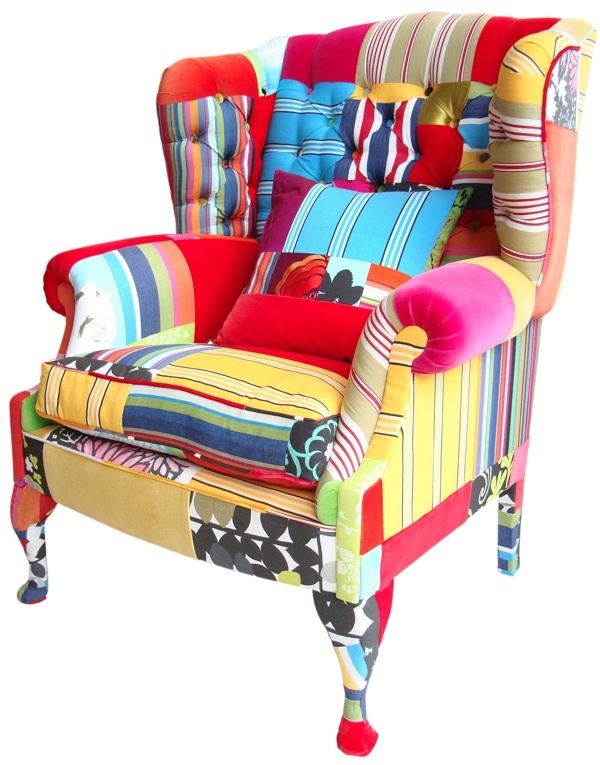 What especially fascinates me about this dramatic and exuberant work is the way it draws attention to the maker’s art. 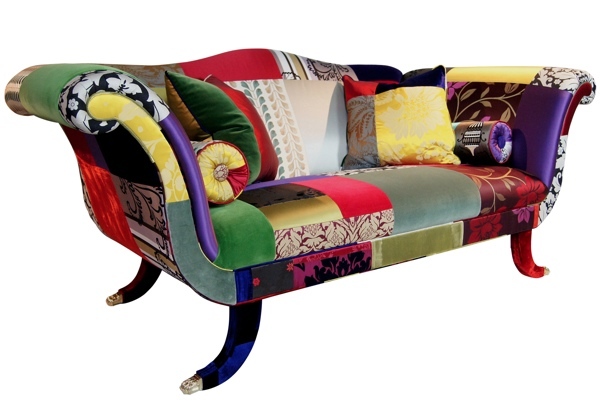 This is upholstery as high drama, in which the process of manufacture is made visible through the patchwork technique, leading the viewer to savour the sensuous quality of the fabric made tangible – in turn – by the ingenious contrasts within the design. 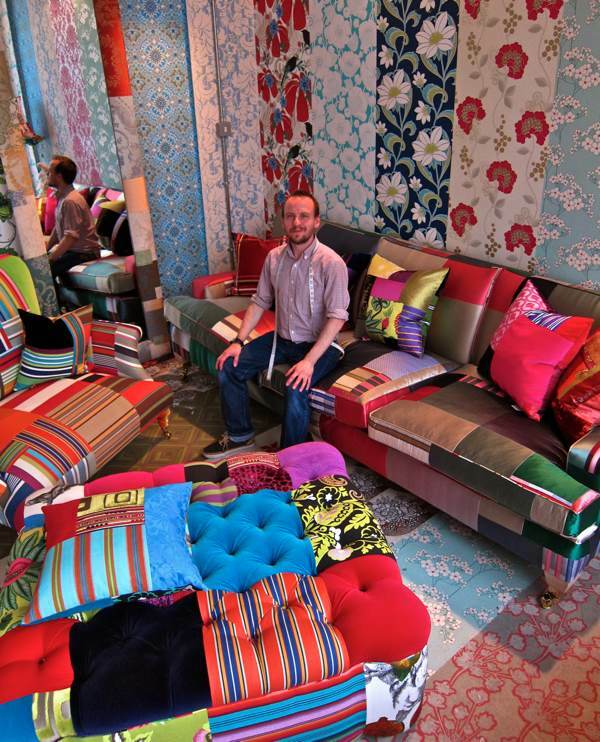 Lucas spends at least a day making up the patchwork for a single piece of furniture and, for years to come, the owners can enjoy these ingenious colour arrangements, contemplating each one as a unique visual diary of a seamster’s life. Lucas cuts the patches one by one. 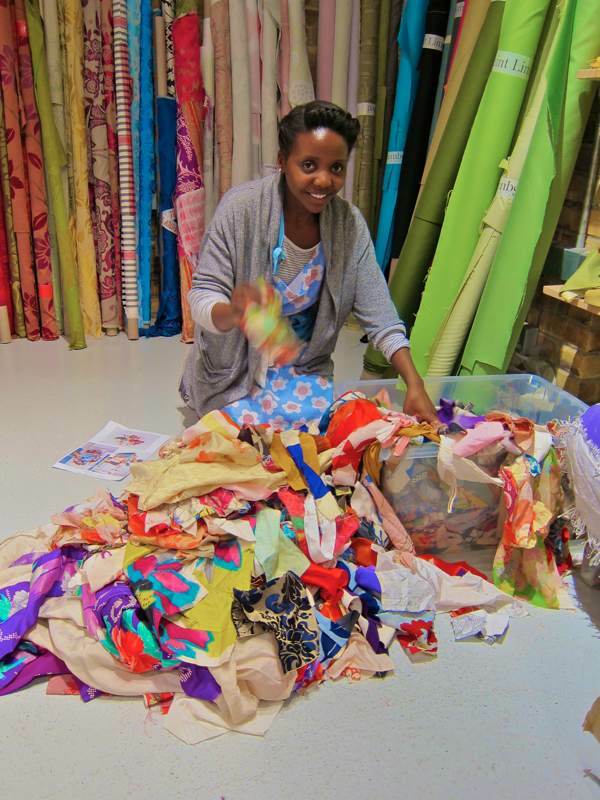 Inutu Lisselo sorts out scraps to wrap a mirror frame. 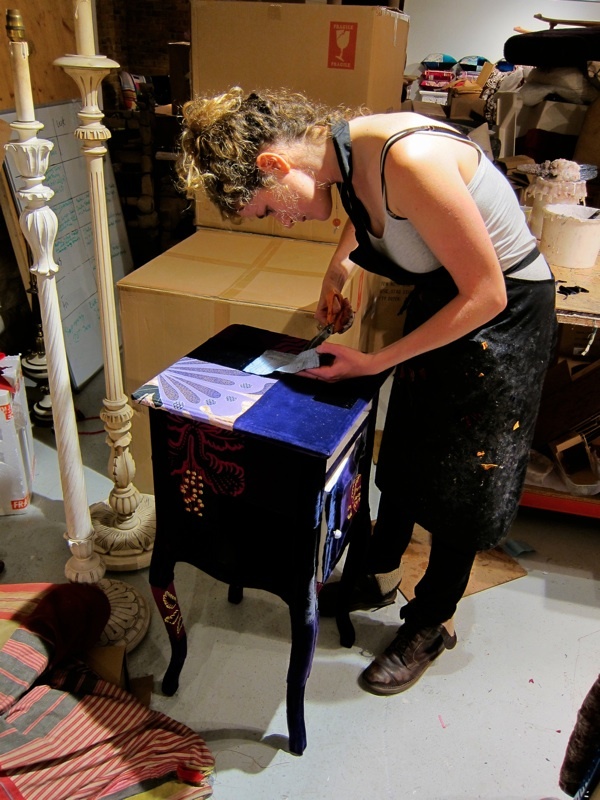 Rachel Postlethwaite wraps a side table. a window into a world! 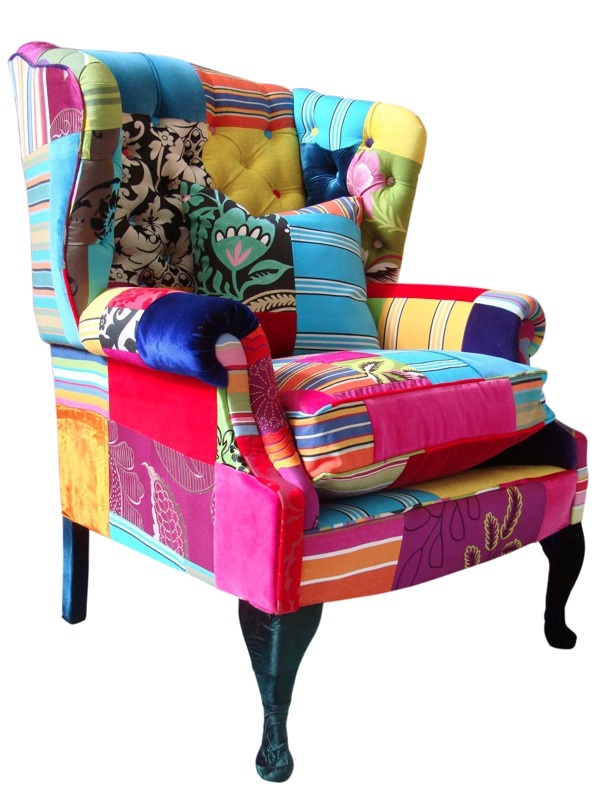 Gosh, how wonderfully bright and colourful these are. 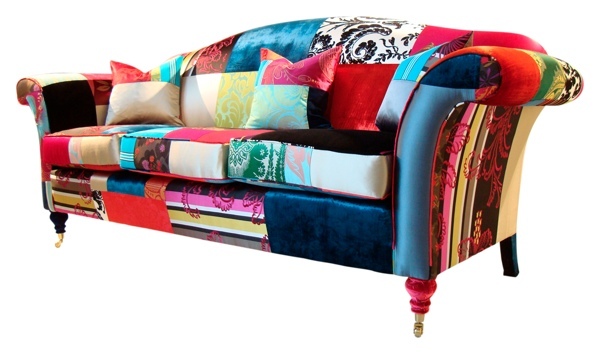 I would love my old sofa to be given a new lease of life like this! I do admire talent like this and it is so good to see it thriving, long may it continue! Wonderful! Just what is needed to curl up on during these grey, rainy, summer days we’re having! 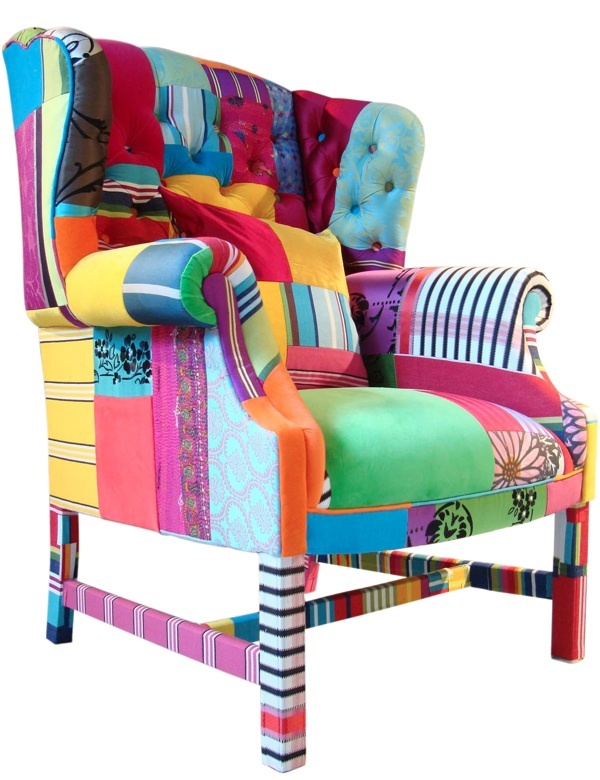 I would love to own one of those chairs, they are beautiful and so unique! 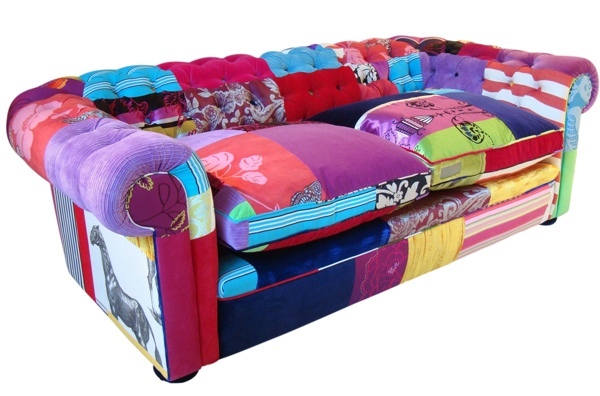 Makes a refreshing change from all the identical mass produced furniture you see everywhere. 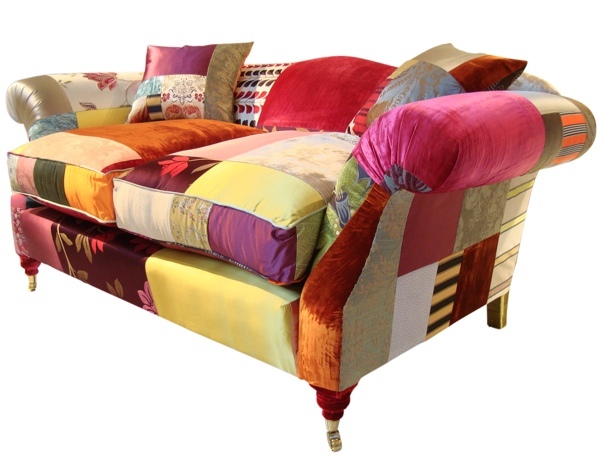 Wonderful comfy and luxurious furniture! Great to see you & your work being profiled Lucas! Oh my word, what a wonderful skill Lucas has, so inspirational, never a need to be dull or boring, thank you Lucas for bringing brightness into the World..
What wonderful work! We all need one of these , they are masterpieces. Go Lucas! Fabulous!! Such beautiful, detailed work. As someone else said, Go Lucas! As an interior design student, it’s so exciting to discover pieces like this! Hi there, my name is Tony and I am the owner of a few hotels which are at the moment under refurbishment. I am very impressed and interested in doing business with you regarding your patchwork products. 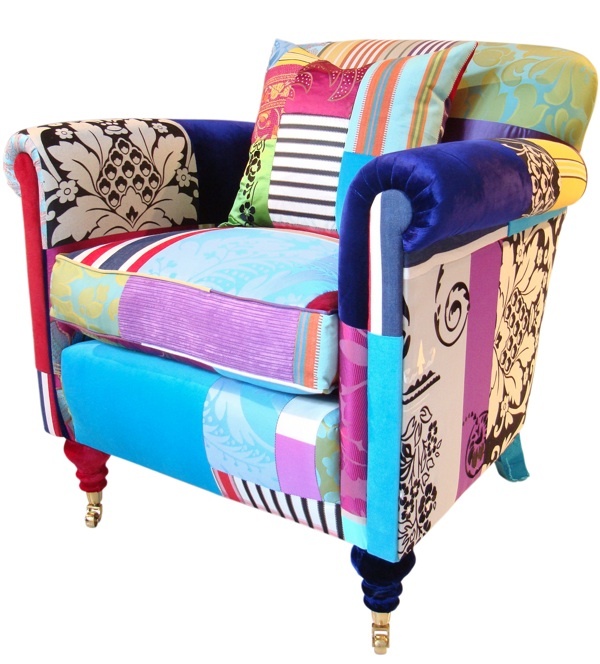 Could you pls forward me a price list of all patchwork furniture you have. Also could you let me know if we could come to some sort of arrangement with discount. I look forward to hearing and doing business with you. MY NAME IS UKASH AND I’M VERY INTERESTED IN PURCHASING SOME OF THESE FURNITURE AS I AM AN ENTHUSIAST PLEASE COULD SOMEONE HELP ME. ALSO I AM LOCATED IN MELBOURNE, AUSTRALIA AND ITS PRETTY DIFFICULT GETTING HOLD OF THIS KINDS OF ITEMS. I have amazed by the vibrant colours that you are using. 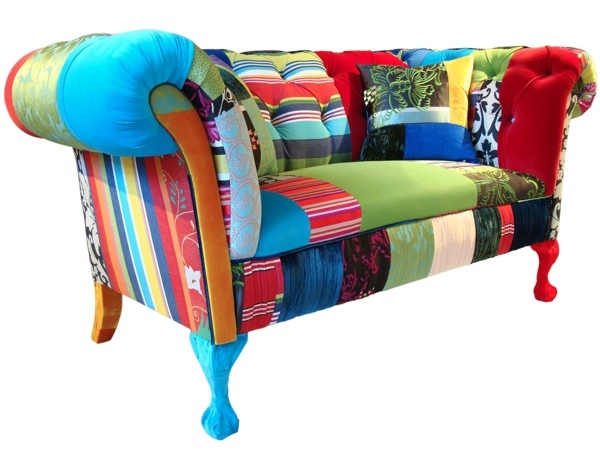 I’m interested of buying a sofa and a chair. Please let me know whether it is possible.